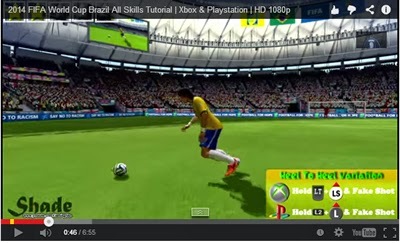 2014 FIFA World Cup Brazil offers everything a veteran FIFA player would like in a Football game. It features a wide arsenal of tricks, juggling skills, and goal celebrations which can be executed by a mere combination of a few buttons along with pushing analogue stick in different directions. While standing still, hold LT + RB. While standing still, push the right analogue stick in any direction. While standing still, rotate the right analogue stick start from the upward direction in either clockwise or counter-clockwise direction. While standing still, rotate the right analogue stick starting from right or left to upward direction. Hold the right analogue stick in either right or left direction. While standing, hold down RB and push the left analogue stick in the downward direction. Hold down LT and push the left analogue stick in upward direction and fake shot. Push the right analogue stick first in upward direction and then in downward direction. Tap the right analogue stick in upward direction three times. Rotate the right analogue stick in clockwise or counter-clockwise direction; you need to start and end at the upward direction. Start from left (9 on the clock) and rotate all the way to right (3 on clock) using the right analogue stick. Exactly opposite of ‘Fake Left and Go Right’. Tap right analogue stick in upward direction followed by tapping it in either right or left side. While standing still, press the right analogue stick. Tap the right analogue stick first in upward direction and then in downward direction. Tap the right analogue stick down and then up two times. Tap the right analogue stick down then hold it upwards and then tap it up. Rotate the right analogue stick in counter-clockwise direction starting from left to right. Exactly opposite of ‘Feint Left and Exit Right’. Hold down LT and tap the left analogue stick in either right or left direction followed by faking a shot. Hold down LT and tap the left analogue stick in any direction followed by faking a shot. Hold the right analogue stick to left and then tap it once to the right. Hold right analogue stick right and tap the left analogue stick to left. Rotate the right analogue stick from left to up and tap the left analogue stick in up-left direction. Tap the right analogue stick to right and the left analogue stick in down-right direction. Double tap the right analogue stick in either down-left or down-right direction. Rotate the right analogue stick starting from right to left. Rotate the right analogue stick starting from left to right. First, rotate the right analogue stick from downward to left and then rotate it from left to right. Rotate the right analogue stick from down to right and then from right to left. Hold right analogue stick in either left or right and then tap it up. Rotate the right analogue stick from up to right and tap the left analogue stick in up-left direction. Tap the right analogue stick twice in upward direction and once in downward direction. Tap the right analogue stick up and then in either left or right direction. Hold down the right analogue stick left and then tap it to right. Hold down LT and tap the left analogue stick down followed by faking a shot. Tap the right analogue stick down and then left or tap it down and then right. Hold down RB followed by rotating left analogue stick from down to left and then rotate it from left to right. Hold down LT and tap the left analogue stick up followed by faking a shot. Rotate the right analogue stick from left to up and tap the left analogue stick to right side. Hold down right analogue stick down. Hold down the left analogue stick at the angle of 90 and fake a shot. Press LT and hold down RB. Tap the left analogue stick in any of the three directions. Starting from the downward direction, completely rotate the right analogue stick in either clockwise or counter-clockwise direction. Tap the right analogue stick right and then left. Tap the right analogue stick left and then right. Tap the right analogue stick down and then up (twice). Tap the left analogue stick up. Hold down the left analogue stick up and then press it once followed by pressing the right analogue stick thrice. Hold down the left analogue stick and completely rotate the right analogue stick starting from downward direction. Completely rotate the right analogue stick starting and ending at downward direction and then tap it up. Hold down the right analogue stick right or left. Press X or B and then A. Hold down RB and press A. Hold down RB and tap the left analogue stick right or left followed by pressing A. While standing still, hold down RB and press A. Hold down RB, tap the left analogue stick up, and press A. Hold down RB, tap the left analogue stick in up-left, and press A. Hold down RB, tap the left analogue stick down, and press A. Hold down LT, tap the left analogue stick either right or left, and press X. Hold down RB while getting the ball from another player. While standing, hold down LT and fake shot. Let go the left analogue stick and fake shot. While standing, hold down LB. Hold LT and then press B. Tap the right analogue stick down when ball is in the air.